What Can Coin Flips Teach Us about Managing a Fantasy Team? Let’s talk about coin flips for a moment. Imagine you have 100 coins in your hand and you dropped them on the ground. Let’s say 50 turned up “heads.” Now imagine you took those 50 coins that landed “heads” and dropped them again. Let’s say 25 turned up “heads” a second time. Now imagine dropping those 25. Let’s say 13 landed “heads.” Now image dropping those 13. Let’s say six coins landed “heads” a fourth time. Imagine looking at those six coins. Do you think you’d see any unusual properties that would make them prone to landing on “heads”? But when it comes to evaluating ballplayers, we tend to endow them with similar unusual properties. Take Dan Haren, for example. As everyone knows, he’s “prone” to having bad second halves of the season. In his career, he’s got a 3.29 ERA before the All-Star Break and a 4.27 ERA afterwards. On this blog, Eno Sarris already covered how Haren’s peripheral stats in the second half aren’t to be feared. What will be overlooked by most is that Haren has always been a great first-half pitcher, yet didn’t live up to his reputation this year. Do first-half/second-half splits mean anything? One regression study couldn’t find any predictive value in those splits. In other words, Haren could very well be just like those coins that landed “heads” again and again and again and again. In a large population, a small percentage will exhibit unusual behavior. For this reason, it’s not worthwhile to buy Haren’s teammate, Adam LaRoche, as a player sure to turn it on now. 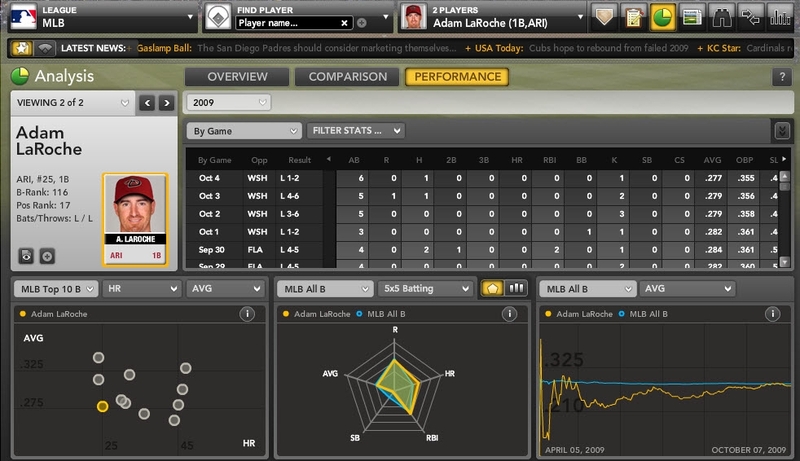 LaRoche has always been phenomenal throughout his career in the later stages of the season. His career OPS before the All Star Break? .776. His career OPS after the All Star Break? .905. If you flipped those six coins above that landed “heads” four times straight, maybe three would land “hands” a fifth time. But that also means three would land “tails.” A 50/50 proposition. That’s what you’re getting in betting that LaRoche will be a 900+OPS player from here on out. Let’s move onto another Arizona Diamondback, Chad Qualls. Some might look at Qualls and see a great few months coming. He’s currently showing a 8.35 ERA, belying a 3.64 xFIP. Might he be even better than that, due some great luck from all the horrible luck he’s had so far? Perhaps Qualls can get his closer gig back and become the best relief pitcher in baseball. Back to the coins. Imagine those three special coins that landed “heads” five times straight. Are they due for “tails”? Nope. Still a 50/50 proposition. Betting that Qualls will outperform his underlying skills is the same as betting that those coins will turn up “tails.” Betting that Qualls is cursed is the same as betting those coins will turn up “heads.” Smart fantasy managing means not betting on hot streaks. It means finding a midpoint, and really reserving judgment on which way that coin will land. For more insight to help you dominate your fantasy league, check out Bloomberg Sports’ fantasy kits. We started looking at what the trade deadline means to fantasy baseball last week by first focusing on the pitchers that might change hands this trading season (you can now scratch Cliff Lee off the list of available hurlers). Now it’s time to look at the position players who might be wearing new laundry soon, and what it would mean to their fantasy value. The man with a pop idol’s name is having a good year from a fantasy perspective. But a look at his underlying skills shows many of his skills remaining unchanged. He’s walking at about the same frequency (8.7% this year, 9.1% last year) and striking out at around the same rate (21.8% this year, 22.0% last year). The biggest difference is his power: a massive .274 ISO (isolated slugging percentage, i.e. slugging percentage minus batting average) this year, .158 ISO last year. Now Hart looks like a speedy, powerful outfielder on a bad team that’s ripe for the picking – just look at his spider graphs from Bloomberg Sports Fantasy Tools. He’s only under team control for another year, too, so the Brewers could be inclined to trade him. The good news for his owners in NL-only leagues is that he’s been most often linked to National League teams like the Giants and the Braves. The bad news is that both of those possible new parks suppress home runs compared to his current home park. AT&T suppresses home runs by 14.6% and Turner Field by 4.3%. Meanwhile, Miller Park increases home runs by 19.3%; so a move, especially to San Francisco, would be a big deal for his power potential for the second half. If owners weren’t trying to sell high already, this news should spur some movement. The Baltimore Orioles lost one of their biggest trade pieces (and second-most likely mover in this week’s first trade piece) when Kevin Millwood went on the DL this week. But that shouldn’t stop the O’s from looking to move their infielders. Wigginton is actually having a good year, as he’s walking at a career-high rate (9.4%) and showing his usual good power (.190 ISO, .182 career ISO). If and when his BABIP recovers (.259 this year, .294 career), his batting average could normalize as well (he’s currently at .253/.336/.443). Because he’s eligible at so many positions, he’s a valuable bench player in head-to-head fantasy leagues, and a great backup in most leagues. AL-only owners might be worried about the rumors concerning Philadelphia and San Diego, but it’s unclear how much trade value the up-and-down Wigginton has. He might be more of a free-agent acquisition for National League owners looking for a little power on the infield. Much of the same could be said about Miguel Tejada since the team has called up possible third baseman of the future Josh Bell. There haven’t been many rumors, but Tejada isn’t very useful to the Orioles right now, and probably won’t be a Type A free agent, so they could probably get their best value from the former shortstop in a trade. Tejada is most useful for managers writing him in the lineup at shortstop in deeper leagues. So like Wigginton, he won’t have much fantasy trade value. This Arizona Diamondbacks pair is much like the Orioles’ duo: two decent veterans who don’t fit a rebuilding team’s future and can easily bring back more value in a trade than as free agents. Johnson has been a revelation in the desert, though, and is under team control for another year, so it would take a little more to pry him loose than it would to get the free-agent-to-be LaRoche. Johnson is walking at a career-high rate (13.5%) and his BABIP is close to neutral (.318 this year, .312 career), so some parts of his game will play anywhere. It is worth wondering if the career-high ISO (.227) would play the same in another park. His home park, Chase Field, currently augments home runs by 27.6%. While there have been general rumors that Johnson could leave town, no specific teams have been mentioned. For now, his fantasy owners should consider shopping him on both a sell-high basis, and to hedge against a trade to the AL. Don’t settle for a middling return, though: Johnson is an elite performer at second base for the moment. LaRoche is having another of his patented seasons, with a mediocre batting average and 25-home run power. But as a free-agent-to-be, he could easily be acquired by a contending team looking to add power at first base, DH, or even off the bench. No rumors are out there right now, and the fact that he’s got little-to-no fantasy trade value in standard 12-team leagues means he’s a hold if he’s on your roster. Florida is only five games under .500, but the Marlins are already 10 games out of first, and more importantly, with many strong teams in front of them in both the NL East and Wild Card races. Both Ross and Uggla are under team control for next year. But Ross ($4.45 million in 2010) and Uggla ($7.8 million) are already expensive, and could become too pricey in arbitration for a Marlins team known for its penny-pinching ways. Ross is having a strange year, as he finally has a nice batting average for once (.288), but it’s propped up by an unsustainable BABIP (.348). Unfortunately, his power has suffered (.138 ISO, .205 career); still, a move out of Florida (which suppresses home runs by 19.9%) would help in that category. Uggla is doing what he always does, but his home slugging percentage (.485) is virtually identical to his away number in that category (.480), so a move out of town might not affect his power as much. The only specific rumor on either player is Uggla to the Rockies, which would have to be seen as a win for Uggla owners. Another duo from a terrible team here, but rumors are still just of a general nature. Honestly, Guillen owners have to feel happy that they got anything from the aging slugger. They have already put those 14 home runs in the bank, and they got them for a bargain price. Anyway, Guillen is best suited to DH and should move within his league, if at all. With his griping to the press, he’s not making himself more marketable, though. DeJesus, on the other hand, is a good all-around hitter and a strong defender, and the team has an option for next year. He’s also not a great fantasy player. Because of his poor power (.136 ISO, .150 is average), mediocre base-stealing ability (47 career stolen bases in 867 games), and position (outfield), he just doesn’t do enough to be a strong fantasy player. Check out his spider graphs from Bloomberg Sports Fantasy Tools. Meh. None of these factors will change with a change of venue, either, so if you’re playing DeJesus in a five-outfielder deep league, you’ll just have to find another high-batting average/low-power and low-speed bat to replace him should he go to the National League. We’ll lump these guys together because the aging first baseman/designated hitter is not one of the most valuable commodities in real or fantasy baseball. They’re a bit too fungible. With that said, Adam Dunn is the prize of the group, a legitimate 40-home run man whose legendarily poor defense would play a lot better as a designated hitter in the American League. His NL-only owners should be nervous around this time of the year, and there is a White Sox rumor about Dunn making the rounds presently. Of course, the Nationals have also said they want to sign him to an extension, so Dunn might stay put. Then there’s the case of Lance Berkman and Lyle Overbay, whose teams would love to move them, if just to save a little money. Berkman’s power has been declining for three straight years now, and his knee may be arthritic. 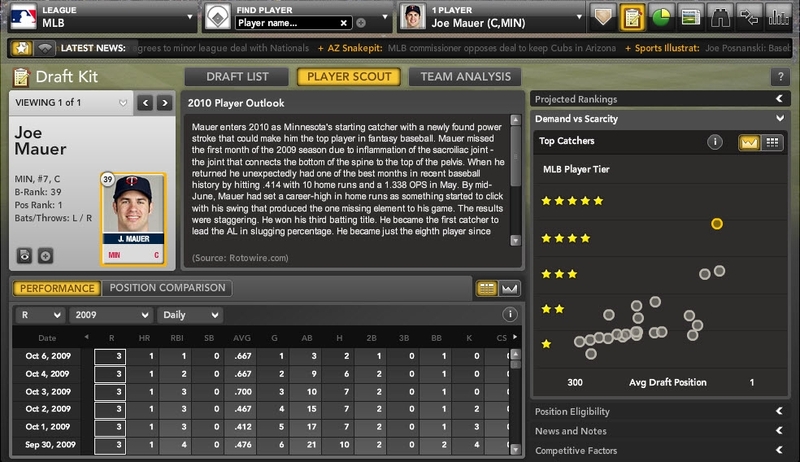 That makes him hard to trade, despite the chance that he goes to the Angels, for example. Overbay is pretty much a bench bat in both fantasy and real-life baseball, so the impact of a possible trade would be low. For more on Corey Hart and other possible trade-deadline movers, check out Bloomberg Sports’ Fantasy Tools. The regular season has started, and now it’s time to work your magic as a fantasy general manager. One of the angles to exploit in the early part of the season is slow starts. There is always someone in your league that is on edge beginning Opening Day, ready to ditch a player at the first signs of struggles. With that in mind, here is a look at some notorious slow starters you might be able to steal in a buy-low trade. LaRoche entered 2010 with a new team, yet got off to the same old slow start. He started his Arizona Diamondbacks career 0-for-13. He’s racked up a few hits since then, but is still hitting an ugly .231/.310/.308 (AVG/OBP/SLG), with no homers, no steals and just 3 RBI in 7 games. Long-time LaRoche owners (if there are any) are not surprised by this start, since the 30-year-old first baseman is your quintessential second-half hitter. For his career, his slash line in the first half is .250/.324/.444. In the second half of the season, LaRoche blossoms into a .300/.363/.546 hitter. The .768 OPS in the first half represents a .141 point difference from his second-half total of .909. He peaks in August with a .933 OPS, and then goes slightly back down to .908 in September. 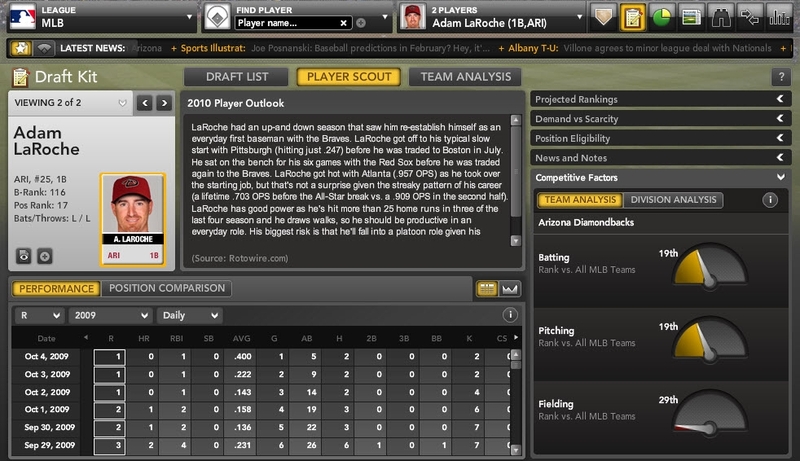 When targeting LaRoche, in trades be sure to exploit his early struggles. If you’re lucky enough to land LaRoche, just be patient as he is likely to once again heat up with the weather. Also remember he should enjoy playing his home games in doubles-friendly Chase Field. Since joining the major leagues in 2008, the Cuban Missile has struggled with his early-season stroke. 2010 has been no different for the White Sox shortstop: He’s hitting .138 with no walks and one extra-base hit through his first eight games. While he is not a second half player per se, Ramirez is definitely a slow starter. In the opening months of the season (March and April), Ramirez has hit just .175/.221/.237 in his career. The monthly OPS of .458 is 409 points less than his best month, June, in which his OPS jumps up to .867. Overall, Ramirez is rated as the eighth-best shortstop according to B-Rank. On the other hand, he is ranked only behind Derek Jeter, Jason Bartlett and Elvis Andrus in the American League. If you do not have one of those three shortstops in an AL-only league, you should be contacting the Alexei Ramirez owner in your league immediately. If the price is too high right now, you might be able to wait a little bit longer if Ramirez holds to form, as his career May OPS of .719 isn’t impressive either. However, don’t wait much longer than that. In the summer months of June, July and August, his OPS jumps to an average of .834 per month, with the usual double-digit home run and stolen base pace. The 27-year-old Astros outfielder is also off to a rough start in 2010 (3-for-25 with no walks). He was even benched for Sunday’s game against the Phillies. The slow start isn’t that big of a surprise, though, given his early-career track record. A career .286 hitter, Pence’s batting average in the first month of the season is just .254. In addition to the batting average struggles, Pence’s power is slow to develop. His .391 slugging percentage in March and April represents the only monthly slugging mark below .462. While he struggles in the first month of the season, history tells us that Pence will blow up in the month of May. His slash line in the second month of the season is .358/.415/.561. His 49 RBI in the month of May are also the highest of any monthly total. Even with the slow start, Pence is likely to cost you a fair amount, given his combined 50 homers and 25 steals in the past two seasons. However, his B-Rank of 87 shows he’s among the game’s top 100 talents, and his owner might not have him valued that high if his early struggles continue. If you can get Pence at a slight discount, do it. the hot topics in baseball and fantasy baseball, with the help of Bloomberg Sports’ proprietary software and analytics. stacks up against all other players. all other catchers, a sign of his unique value. Now let’s explore a player whose ranking isn’t as obvious, newly signed Arizona Diamondbacks first baseman Adam LaRoche. According to B-Rank, LaRoche rates 17th among all major league first basemen for projected 2010 fantasy value, given standard 5×5 criteria. In a 12-team National League-only league or deep mixed league, LaRoche would be worthy of a starting job. He would project as a mid-to-late round pick, in a cluster with decent but unspectacular players like the Dodgers’ James Loney in the Scarcity vs. Demand graph. Using our Spider Chart, you can see that LaRoche derives most of his value from counting stats such as home runs, runs scored and RBI, with less value derived from his batting average and virtually none from stolen bases. At a glance, you can spot LaRoche’s 2009 totals in every category against other players major league-wide, or just other first basemen. His 25 home runs, for instance, placed just below the average of 27 homers for qualifying MLB starters at first base, well below the MLB-leading total of 47 at that position. in that two-category combination — home runs and batting average, RBI and stolen bases, and other customizable combinations. The Bloomberg Sports team of writers will then dig up more nuggets of information for your perusal. Say you’re satisfied with LaRoche as a low-end starter for your team. But you’re concerned about his large splits – for his career, LaRoche has batted .252/.326/.447 (AVG/OBP/SLG) in the first half, with a much stronger .300/.363/.546 line in the second half. You might then view LaRoche as someone to target in trade around the All-Star break, rather than spending a pick on him in your draft or auction. Ascertaining why a player fares better in one half of the season compared to the other can be a tough task. 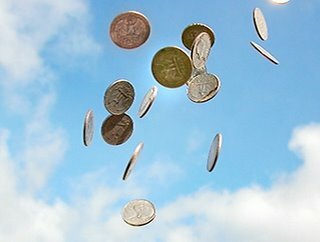 Often it’s the equivalent of flipping a coin and landing on heads five times in a row: a rare but possible occurrence that’s based simply on random chance. Occasionally there might be other reasons. Some players perform better in warmer weather, or at least hit for more power in warmer weather. In Pittsburgh and even Atlanta, where he played the bulk of his first six major league seasons, LaRoche’s power indicators jumped across the board as temperatures rose. For his career, he’s hit home runs on 12.7% of his flyballs in March and April, 11.7% in May and 12.8% in June. That number soars to 18.9% in July and 17.0% in August, making LaRoche a greater power threat in the warmer summer months. In sweltering Phoenix, LaRoche can expect average highs of 84 in April and 93 in May. By June, the Diamondbacks will likely close their retractable roof for most games, with average temperatures near or over 100 for the final four months of the season. The closed roof would in turn create cooler home playing conditions as the season wore on. We can’t say for certain if LaRoche’s superior performance and higher power output in the second half is the result of warmer weather – it could simply be another way to look at the same random streak of better second-half performances. If it is weather-related, though, playing in Arizona, and facing warmer-weather opponents more often in the NL West, could portend a hotter-than-usual start for LaRoche. LaRoche could also get a boost from more favorable ballpark effects. Chase Field consistently ranks as one of the most favorable stadiums in baseball for hitters – second behind Coors Field in run factor last season and second behind Rangers Ballpark in Arlington. Chase’s configuration also plays to one of LaRoche’s greatest strengths as a hitter. LaRoche has averaged 37.5 doubles per year in the past four seasons, ranking him among the league leaders in that category. Only Fenway Park, with its shallow, towering Green Monster, has yielded a higher doubles effect in the past two seasons than Chase Field. and drive in runs – meaning you might want to consider a different option at first base. Baseball Draft Guide, The Fix. Erik Hahmann: His baseball and fantasy baseball writing has appeared at Heater Magazine, DRaysBay and Beyond The Boxscore. Tommy Rancel: He’s written for a number of publications, including Beyond The Boxscore, Inside the Majors and The Hardball Times. Cactus Leagues and we couldn’t be more excited to start the season. Bookmark bloombergsports.mlblogs.com for the latest news and analysis. You’ll also find us as a Featured blog at MLBlogs.com, as well in the MLBlogs.com Pro Blogs pull-down menu, under Fantasy. Also, follow us on Twitter @BloombergSports and Facebook. Then, be sure to check out Bloomberg Sports’ Draft Kit and In-Season Tools.